We're gonna bring in the power! We're gonna light up the darkest night like the brightest day in a whole new way . . .
You know it's in the back of your mind somewhere . . .
We're gonna tell you the truest word that you ever heard anybody say . . .
Come on, think . . . Rita Moreno . . . Morgan Freeman . . . Irene Cara in the Short Circus . . .
Movin' out in a new way! If you recognize these words, and can hum along the tune, then you are a true child of the 70's. Not a teen of the 70's, a child, say, between the ages of 4-8. Someone who was born between, oh, 1966 and 1976. It's comin' down the line, strong as it can be, through the courtesy . . . .
Ah, The Electric Company. Sometime after one outgrew Mister Rogers and Sesame Street, there was The Electric Company to help one learn to read. Who can forget Jennifer of the Jungle? The Adventures of Letterman? Those silhouetted figures saying ch . . . alk . . . chalk while softshoe music played? Watching the Electric Company segments which have been posted to YouTube, I can even now sing along with many of the sketches, and I really believe that one of the reasons I immerse myself in the English language is that Electric Company was so much fun to watch. The pung-pung-pung-punctuation song has been running through my head on and off for, well, 30 years, which may explain why I'm one of the few people left who understands when to use a colon, and when to use a semi-colon. This week, I appreciate the producers, writers and actors (and all the crew members) of The Electric Company, who educated a generation and helped us learn to read. And I really appreciate the people who took the time to upload these segments onto the internet. It's not just a time-waster . . . it's a treasured trip down memory lane. To whoever did this: Thank You! And now, my favorite Electric Company segments from YouTube. Sit back, relax, and enjoy the ride. It's a word . . . it's a plan . . . it's Letterman! Today I went to the post office to pick up some packages that were waiting for me. They were birthday presents from blog readers! People I've never met! Yay! Thanks so much to Jacqueline Schutt, for getting me the 2006 Writer's Market Deluxe Edition. It will be a great help to me in my work. I really appreciate it. And many thanks to some people calling themselves "The Bruin Boy Bunch: Barry, Renee, Celia, Nathan, Samantha, Morgan, Ashleigh and Shomer Chai" for *NSYNC's "No Strings Attached" and "Celebrity" albums. Yay! Want to buy me a present? My wish list is here. Our Funky Little Blogging Bear, Dovie, has asked me to be a guest blogger over at his place this week. All that means is that many of my posts here will be cross-posted there. And I get publicity. And now he gets publicity. Thanks, Dov Bear! So, there is this very popular (notorious? ), very controversial, very left-wing blogger named Daniel Sieradski, aka the Orthodox Anarchist. The title of his blog says a lot about the many layers on which this guy functions. I've met him once for a story I was writing, and he struck me as a really nice guy. Do I agree with his politics? Hell, no. But the guy cares a lot about Jews and Judaism, and even when I think he's waaaaaay misguided, I know that his intentions are good and that he feels a very strong connection with the Jewish community. He's got a good soul, that Dan. He's crazy, but he's got a good heart. I don't mean that condescendingly. I just mean it. And, some of the stuff he does is really very productive and important. In case you can't read the print, it is a "Benefit concert for civilian war relief on both sides of the border." Happening tonight in Jerusalem. 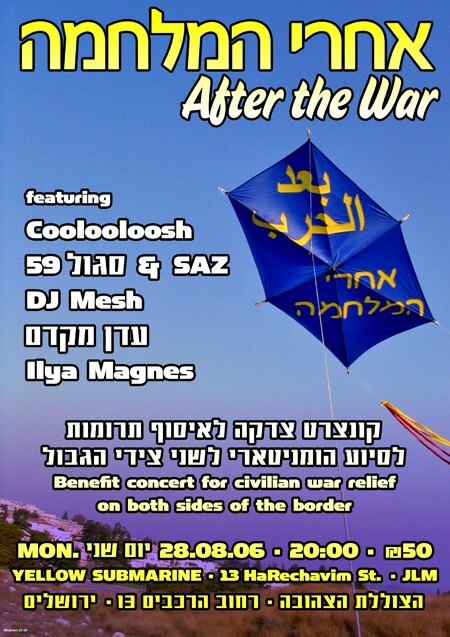 According to press reports, all proceeds will be split 50-50 between organizations that are helping civilians in northern Israel, and organizations that are helping civilians in southern Lebanon. At this point, I can see reasonable people having a range of reactions. My personal reaction was "isn't that nice? If I'm not busy, maybe I'll go." I can also see reasonable people saying "it's nice, but I'd prefer to give 100 percent of my charity money to organizations that will help my own people. Family comes first." I can also see reasonable people saying "Before I make any judgement about this event, I want more information about exactly which organizations will get the money, and howDan is ensuring that the money will be used only for food, medicine, and other humanitarian needs, and won't end up in the hands of people who seek to destroy Israel." And finally, I can see reasonable but very grumpy people saying "why the hell does he care about Lebanese civilians? Damn lefties," and then turning the page of their newspaper and rolling their eyes whenever they hear about this concert, but not giving it much more thought. But what I do not understand, what I think is completely unreasonable -- unless I'm really missing something here -- is why anyone would be so against the idea of humanitarian aid to Lebanese civilians that they tear down the posters, write egregiously nasty emails to Dan, suggest that they want to beat him up, and otherwise make his life miserable. It's one thing to say "our own come first" or "stupid Lefties" and then go on with one's day. But to write a nasty, threatening email to Dan, or to tear down the poster, is to go out of one's way to express anger that anyone is considering Lebanese feelings at all. I don't understand this. Is there something about the concert I'm missing? 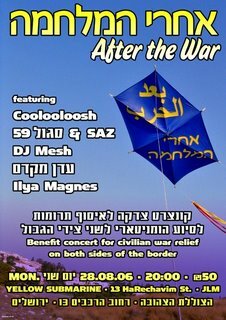 Or are people -- mostly Orthodox people, according to Dan, and much to my chagrin -- so appalled by the idea of anyone helping Lebanese civilians in any way -- at the same time that they are raising money for Israelis -- that they will actually spend time and energy trying to make the concert not happen? Spending time and energy to raise money only for one's own side, I totally understand. Spending time and energy to protect oneself from attack, I certainly understand. Spending time and energy educating others that Israeli civilians need aid and that Israel had good reasons for fighting this war, I understand. But actively trying to stop the Lebanese civilians from getting aid? Even though it means preventing aid to Israelis as well? Going out of one's way to undermine an event whose aims, in addition to preventing Hezballah from having a monopoly on reconstruction efforts, presumably include working toward peace . . . even if you think it won't work, or that it's not important, why try to stop it? Why get angry that it is happening? If you think the idea of this concert is stupid and a waste of time, then don't go. That's it. Why bother going out of your way to get nasty about it? Please tell me I'm missing something. OK, so, over Shabbat, at both meals (not at my house), the subject of Iran came up, and we all had lovely discussions over whether we'd prefer to die immediately in a nuclear, biological, or chemical attack, or survive the initial attack but languish for years with radiation sickness, cancer, etc. Since we were all single with no kids, we all said we'd rather die right away than have to look at years of disease and the utter desolation of the only Jewish home. Perhaps if we had kids to protect we would have felt differently; I'm not sure. Let's take a look at where we are: The UN and various countries are slowly sending troops to patrol southern Lebanon, but they have stated that they will not disarm Hezballah. So, um, what is the point, again? Meanwhile, almost the entire Western world is still delluding themselves into thinking that this war was about Israel, Lebanon, Syria, and Iran. Hello! People! The Muslim-Arab states don't hate the West because of your support for Israel! They hate Israel because they think Israel represents the West! This is not about Jews! They don't want any Christians, either! Or any Enlightenment secular people either! WAKE UP!!! Israel is on the front lines of YOUR war. If they destroy Israel, they are coming for you next! If you turn the other way while Hezballah does whatever they want, it's just a matter of time before there are missile launchers in the playground down the street from you! Hello! IS ANYONE HOME??? Fine. No one is home. And in addition to no one being home, I've got people at this blog and at Israelity trying to post comments, many many comments, to the tune of "You Israelis are dirty Nazi pigs. You are so intolerant. You just like to kill people. So, you deserve to die. In fact, if I were living in the Middle East, I'd come over and kill you myself, you disgusting intolerant murderers! Peace." And then there is the foreign media, Haaretz, Shamnesty International, and Jewish Fights Watch. Don't even get me started. So, Israel can rely on no one, because everyone else has their heads in the sand. But we can rely on ourselves, right? Our own government will do what it can to protect us, right? What the hell were they thinking signing this cease-fire? And, while they were busy pouring millions of shekels into the withdrawal from Gaza (which I supported with misgivings), no one was giving any thought to training reservists for a possible war because . . . why? The soldiers who fought in Lebanon were not given enough food or water because . . . ? They were disorganized, ineffective, basically on suicide missions, because . . . ? If I didn't have so much work, I'd be right there at the reservists' protests, calling for the resignation of Olmert and Halutz myself. They are wussy pansies. She was, very recently, set up on a blind date with a man who is 45. They had a nice conversation on the phone, and arranged to meet at a cafe. On the night of the date, she carefully arranged her hair and put on nice makeup. She changed her outfit several times, wanting to look special. She hadn't had a date for a while. It's not easy, being single, female and 35. When she showed up at the cafe, the gentleman was sitting at a table with another woman, who seemed to be in her twenties. The man introduced the two women to each other, and for the rest of the evening, the three of them sat there, getting to know each other. It turned out that the man thought he could kill two birds with one stone by scheduling dates with two women at the same time. And then he asked Rena if he could call her again. Oh, yes, he did! But here is the kicker. Rena is so desperate . . . her standards have become so low . . . that she is actually thinking about going out with this man again. To me, that is the craziest part. That a woman could be so beaten by the dating world that she is trying to convince herself that maybe this man is worth seeing again, since he's asking, is, to me, the craziest and saddest part of the whole story. We recommended to Rena that she go out again, and arrange with a male friend to go with her, so she, too, can schedule another "date" for the same time. But, really, the fact that she didn't walk out of the cafe as soon as she realized what is going on is, for me, the most telling part of the tale. She's attractive, intelligent, and socially competent, and yet she has gotten so little from men, that she's stopped expecting anything more than to be trod upon. Don't worry, I'm not sick or even particularly stressed out. I have not been travelling (much). It's just that I've been working really really hard (thank God, I have the work!). I did a story this week on almost no notice, and picked up a new client -- an Israeli business for whom I'll be writing a website, so I had to go over there and learn all about their business -- and yesterday I spent a day in Mitzpeh Ramon, for a travel article I'll be doing. Plus there were revisions to do, clients to chase for payments, etc etc. Lots going on. Thank God! Mitzpeh Ramon was amazing. It's a desert town about an hour south of Be'er Sheva, in the Negev Desert. The town has a population of about 6,000, and is situated at the edge of a large crater called a Machtesh. A machtesh looks like a canyon, but was formed by different geological forces than a canyon is. Macheteshim are unique to Israel, and are known around the world by their Hebrew names. *Picked up two policemen at a checkpoint; they needed a ride south. They were very nice guys. Only in Israel do the policemen hitch rides with citizens passing through a checkpoint! *Watched some kids learn to rappel down the side of the cliff. *saw a fancy sundial on the roof of the Visitor's Center at the machtesh, one of two of its kind in the world. Science is cool, man. *Fed some llamas and alpacas at The Alpaca Farm - so cute! *Learned some basic archery at a campsite that also offers "Archery Golf." * Checked out a bed-and-breakfast that also offers jeep tours and spa treatments. *Had lunch at one of the four kosher food-service places in the whole town. Most of the town is all "the ingredients are kosher, but we're open on Shabbat and do not have kashrut supervision." Uh, thanks anyway. *Had a scrumptious dinner at the Ramon Inn hotel, known not much for its rooms, but famous for its food, which was indeed unusual and delicious. *Saw a natural rock formation in the middle of the desert that looks just like a camel. It was spooky, how much it looks like a camel. * Visited the "desert sculpture garden," which spoke to me not at all and seemed a little weird. *Saw a lot of wild Ibex, who wander around the town of Mitzpeh Ramon in herds. *Stopped at the side of the highway on the way home, after dark, and gazed at the stars. The visibility was incredible. Stars are cool, man. I'm exhausted, but it was a good day. Thanks very much to my guide, from Keshet: The Center for Educational Tourism in Israel. OK, on a different note, I am a little stressed. Partly because I have so much work. I am drowning. Thank God! And partly because I am having a hard time balancing my work schedule with three other needs in my life: healthy food, exercise, and a clean apartment. Time management is hard, man! And partly because of the whole "situation" between Israel and its neighbors. My stress has found a focal point in Human Rights Watch and Amnesty International. I actually had nightmares last night -- tossing and turning, nightmares! -- about Amnesty International. I woke up more exhausted than when I went to sleep. What a complete waste of emotional energy. My Sister is My Hero - NOW WITH UPDATE! Years ago, Rivka and her husband decided to get their own 800 number. It would allow my mother to call more easily from the hospital, and as my nephews got older it meant they could call home from anywhere. After a while, I think they stopped needing it much, but they held onto the number anyway. A year ago, they started getting phone calls from people asking for the insurance company Secure Horizons. At first, it was just a small annoyance. But as more and more people called asking for the insurance company, Rivka finally asked one of the callers why this mistake was so common. Turns out that Secure Horizons accidentally printed my sister's 800 number on the back of the their customers' membership cards. Rivka called Secure Horizons and explained the problem to an agent, who said that a manager would call her back. No one ever did. So Rivka tried again, four more times. Each time, she was told that someone who was authorized to work out the problem with her (ie, reimburse her for the calls she'd been getting on her phone, get her a new 800 number so Secure Horizons could take the old one, etc) would call, and then . . . nothing. I should perhaps interject here and mention that, given our mother's chronic illness, there is no love lost between our family and insurance companies. Insurance companies are evil incarnate, as far as we are concerned. "You have reached the ______ family. If you are trying to reach Secure Horizons, please be aware that this is not the correct number. Also, you should know that the Better Business Bureau has given Secure Horizons an F rating." Then she stopped answering that phone, so that everyone who called would hear that greeting. The very next day, two managers left messages on the machine, saying they would really like to speak with her. She got your attention now, huh, jerks? "Mr. J----, you have no idea why I am getting your phone calls, do you?" "How much were you planning on spending on this "screening company"? "Okay, let's do a little math here. I complained to your company three months ago that I was getting your phone calls. That's about 66 business days. Now let's average that I get three wrong numbers a day from your customers. And, let's just say you pay your operators minimum wage, about $7.00 an hour. That's three calls, three hours, $21 a day, 66 days...$1,386. I'll round it down to thirteen hundred. You send me a check for thirteen hundred dollars, and I'll disconnect my 800 phone number." "Um, I, um, will definitely have to get back to you on this." That was yesterday. Today, Mr. J---- called me back. "We have decided that your request for thirteen hundred dollars is fair, and we will send you a check as soon as possible." "Thank you, Mr. J----. I won't disconnect the number until I get the check, but I can promise you that I will change the message on my answering machine right now. As soon as I get the check, I will disconnect the number." So I ended up being the winner in this, I think. I think so too. And, dear sister, if you use some of the money to buy something from my birthday wish list, we can both be winners, eh? As I've mentioned before, I write the content for a series of English-language magazines for Israeli kids who are studying ESL. The magazine is given out in schools by the English teachers -- it goes out to all sorts of school systems: secular, religious, ultra-Orthodox, and Arab. I write most of the articles on four levels. The highest level is for high school kids who are taking the English matriculation exam soon; I write those pretty much the way I'd write for any magazine, perhaps a tad more simply. The lowest level is for fourth graders who are just beginning their English studies. All sentences are short, and, whereever possible, in present tense. Words are extremely simple, and repeated often. Most of the words are translated into Hebrew at the bottom of the page. Obviously, not all stories for the older kids can be simplified like that, and not all stories for the younger kids are interesting to the older ones. But in general the topics overlap. For the September issue, both pages of the double-page News spread will be devoted to stories about the war over the summer. For the older kids, I'm still in the process of researching the stories, since they require more details and quotations from other sources. But for the fourth graders, I was able to sit down and just write the stories of the war, because the whole point is to leave out anything complicated. They are only 9 years old, and they don't speak English. But . . . how does one simplify a war? Here's my rough draft. Before I send it in I have to simplify it even more. Israel fought with Lebanon. There were rockets. It was scary. People left home. The war ended. Things were normal. People went home. They hope it will stay quiet. They hope for peace. In the north there were rockets. In the south it was quiet. Some homes were full of people. “Israelis must help each other,” people said. In the north are many Israeli Arabs. Jews were hit by rockets. Arabs were hit by rockets. The rockets hit everyone. It was scary for all Israelis. Bombs fell. People went into shelters. The shelters were under ground. It was boring. Spongebob visited them. He played with the children. The children were happy to see him. Some people wanted to get married. Then the war came. Where could they get married? There was a big wedding. Very big! Thirty people got married! The wedding was in Tel Aviv. Yeah. I guess that pretty much sums it up. Ahead of the cease-fire, Haifa's air-raid sirens went off 15 -- count 'em, 15 -- times on Sunday. But yesterday the (useless, ridiculous, embarrassing, suicidal) cease-fire took effect, and by the time I arrived in Haifa last night, all was quiet. I knew that the Israeli IDP's (Internally Displaced Persons - a term I learned from a reader) were starting to head back north when I saw the line for my bus. Since when is a 7:30 pm bus from Jerusalem to Haifa, on a Monday night, full of families? I sat across the aisle from two little girls, about 7 years old, who spent the 2-hour ride talking about Katyushas. When I disembarked, I saw that half the people on the bus were hauling huge suitcases from the cargo space below the bus. Yup - returning residents. I spent the night at the home of Yael and Moshe S., a nice couple who made aliyah from the US, who are friends of a friend. I'd stayed with them once before, back when I went to Haifa for my old friend's wedding. From the bus station to my hosts' place, I took a taxi. On the way, the driver was asking me about my aliyah, and as many taxi drivers do, he asked whether I have family here. Nope. Just good friends, who have become like family. In particular is my friend since kindergarten, who made aliyah four years before I did. "Speaking of very old friends," the driver said, "I once had a passenger who was going to a wedding at Kibbutz Hachotrim. She said that it was the wedding of an old friend, someone she hadn't seen for many years, and . . . "
. . . and the driver proceeds to tell me my own story! He was talking about me! It was the same driver I had on my way to Jenn's wedding! I feel like there is a lesson in there, some sort of sign, but I can't figure out what it is! Maybe just that Haifa is not as big a town as I thought? Anyhow, Yael and Moshe brought up a point that gave me pause. One of the things I love about Haifa -- that a lot of people love about Haifa -- is that it is so "laid back." It doesn't have the deep intensity of Jerusalem or the rushed pace of Tel Aviv. It's probably the most "normal" place in Israel. Moshe wondered whether, after several weeks of bombardment, and residents who had to flee, the city will be as relaxed as before. Will it go back to normal, or will the scars from this war remain? I hope the former, because I've always thought of Haifa as the place I'll move to if I ever get tired of breathing the holy, tense, exhausting air of Jerusalem. Today I spent three hours interviewing a family in Haifa, for the Westchester Jewish Chronicle. I've been doing a monthly feature for the Chronicle, the "Aliyah Diaries," profiling singles/couples/families who moved to Israel from Westchester. Unlike the previous profiles, this one will not be a "rah, hey, Aliyah, yay!" sort of story. The family in question has had a very difficult time financially, and said if they'd known three years ago what they know now, they would have organized their plans very differently. And of course the war took its toll as well. This month's installment of the "Aliyah Diaries" will be more gritty than previous ones. I'm glad in a way, because it's important to keep things real. On the way home there were two religious Muslim women on my bus. Why is it that I always see Muslims in the Haifa bus station, taking buses to Jerusalem, but I never see them in the Jerusalem station, taking buses to Haifa? Things that make you go hm. 1- Last Thursday night, I took a few friends to the home of Sara Brownstein, where she taught us how to make challah. Challah is a traditional, usually braided, bread eaten by most Ashkenazi Jews on the Sabbath. Having never made bread before, we were most appreciative about learning this ancient skill. It turned out to be much less intimidating than I thought. I'm proud to say that my dough rose beautifully, and the two medium loaves and two rolls I produced came out nice and soft. A little too yeasty, but that can be fixed next time with less yeast or more sugar, I guess. Sara is a very holy, spiritual woman (who will kill me for describing her as such if she finds out about this blog post), and she urged us to see challah-baking as a sacred activity that connects us to all Jewish women throughout history. It was more of a Torah class than a baking class, with Sara explaining how each ingredient symbolizes a different way for us to grow as people. It was one of those classes where you have to leave your cynicism at the door -- but while we were there, we really enjoyed it. Leaving one's cynicism at the door sometimes feels good. And all four of us got to walk around Emek Refaim street afterward carrying large bowls of dough, covered with kitchen towels. Pretty funny. 2- I neglected to blog about it, but last week I went to Kfar Chabad, a little town near Ben Gurion airport populated exclusively by Lubavitcher Chassidim, to write about the "refugee camp" in their yeshiva dormitory. You can check out the finished story here. (There is an error in the story; "Malka" and "Moshe" are not in the dormitory, but rather still staying with a family. I'm working on getting that corrected.) And in case you missed it, here's my story about my trip to Safed the week before last. 3- Shabbat was nice. I slept over at the home of my friend Judi and spent the time eating, sleeping, and reading People (Lance Bass is gay? Who knew? She says, rolling her eyes. I am so surprised. / sarcasm) and Real Simple (Did you know you can peel off stickers from new drinking glasses more easily if you first heat them with a hair dryer?). In the late afternoon we took a walk through a park overlooking the historic Valley of the Cross. The view included the Knesset, the Israel Museum, and the Central Bus Station. Nice and relaxing day. You have to understand, *NSYNC is my new escape from thinking about the war. That, and the copy of John Grisham's The Broker that I bought on Thursday along with the "Lance Bass is Gay" issue of People. We do not talk about Fight Club, you understand? 4- Most dramatic for last . . . this morning I picked up my first-ever pair of eye glasses. They are pretty trendy, blue rectangular frames. I wanted something that I could feel was a cool accessory, not an embarrassing sign that I'm getting older. I have to admit that they are pretty cool, but it's going to take me a while to get used to them. It's amazing how well I thought I was seeing the world, when I wasn't. Sing along with me: I can see clearly now, the blur is gone! One more note: I'm going to Haifa soon to profile a family who lives there. I'm hoping that what with the (stupid, idiotic, completely nonsensical) cease-fire, I will once again avoid any rocket fire. Bli ayin hara, poo poo poo. Once again, please do not mention this to my parents. Thanks! Reminder: My birthday is in just a few days. Wish-list is here. I recently got in the mail my copy of a journalism award I won in June. It's not the Pulitzer, but it's still nice . . . The American Jewish Press Association gave me a 3rd place Simon Rockower Award (the award for Jewish journalism) in Feature Writing for a piece I did called "People of the Blog," for the World Jewish Digest. A cease-fire is supposed to take effect tomorrow morning. But neither the Lebanese army nor an international “peace-keeping” force will arrive in south Lebanon for at least a week, possibly more. What does anyone think Hezballah will be doing during that week? Until those other forces arrive, the Israeli army plans to stay in south Lebanon . . . to do what, exactly, if they are supposed to “cease firing”? Hezballah says they will continue to fire on whatever Israeli soldiers remain in Lebanon. So, we can expect that for at least the next week, Hezballah will fire on Israeli soldiers, and those soldiers will fire back. What’s supposed to happen tomorrow, again? Oh, maybe Hezballah will stop firing rockets onto northern Israel . . . ? But, why should they? The cease-fire agreement is not between Israel and Hezballah, but between Israel and Lebanon. Hezballah has made no promises to stop attacking Israel. We're relying on other people to stop them, people who won't arrive for at least a week. And . . . we’re supposed to believe that Lebanon and an international “peace-keeping” force will do a better job than they were the last few years, while Hezballah was collecting arms under their noses, because . . . . . ? Is it just my imagination, or does this cease-fire agreement help Israel not at all, none whatsoever, and simply give Hezballah carte blanche to continue doing what it’s been doing the last few years? Am I totally off base in predicting that a few years from now, possibly less, Israel and Lebanon will just go through the same process we just went through this summer? Is it just me, or does this cease-fire have absolutely no benefit to anyone, Israeli or Lebanese, except Hezballah? Perhaps I’m missing something? I really hope to God that I’m missing something. Reminder: If you are looking for blogger posts showing how real people are living their real lives in Israel (be it in the war zone or in "safer" areas), I recommend heading over to Israelity. It's a site that compiles blog posts by English-language bloggers all over Israel. There's lots of good stories there. I know because I found and posted them. Ah, summer. The distant humming of honey bees in the clover, the laughter of children playing in a sprinkler, the smell of suntan lotion. Summer. Season of sand, surf, and tension in the Middle East. Also, the season of my birthday. Yes, my friends, it is that time of year again. Time to remind you that I spend many, many hours maintaining this blog. Time to urge you to take a moment to ask yourselves "What have I done for Sarah lately?" Time to tell you what I want for my birthday, which is on August 18. If anyone wants to tape CSI and/or Without a Trace for me sometimes and send me the videos, that would be great. Or get it off your chest here and here. Ooooooh, how I miss Redbook. And Glamour. And People. And Newsweek. And Time. And international subscriptions are more than a poor freelancing girl can afford . . . . but how she misses them . . . .
What wouldn't Sarah do for a really high-quality digital camera, with a good zoom lens. She goes north during a war with Lebanon. Shouldn't she have a new camera? My kingdom for a laundry dryer. Gasp! I almost forgot one of my favorite magazines! This is the best Shabbat reading ever! Please buy me a subscription! I'm feeling much better than I have the past few days. My friend Rachel and I went to a water park at Kibbutz Chafetz Chaim, about 45 minutes from Jerusalem, near Latrun. The park has separate hours for men and women, so we could all walk around in our bathing suits, disturbing neither our religious sensibilities nor any "body image" issues. I know it sounds quite Victorian to a lot of people to have separate swimming hours, but you know what? It was so comfortable. There were women and girls in all manner of swimwear: some in bikinis, some in one-piece suits, some with a t-shirt over the bathing suit, some in dressrobes or swimdresses that almost completely covered them. And no one cared. It couldn't have mattered less to anyone. You don't have to be religious at all to sense how much easier it is for women to completely relax when there are no men around, especially when they are in bathing suits. You'd be surprised by how many non-religious women take advantage of women's hours at beaches and pools. Anyway, I'd never been to a water park before. I've been swimming of course, but this was my first time in a huge corkscrew slide with water rushing down it, and me rushing down it. It was amazing! We went down a couple of slides, then hung out in one of the big pools, just sort of lounging around in the water. So refreshing. I'm like a different person. Of course, no matter how hard we try to get away from thoughts of the war, the war comes to us: As we were eating lunch in the family area after the women's hours ended, two military planes flew overhead. The 250-300 people eating their lunches under the pergolas looked up, and were quiet, and watched the plane as it disappeared to the north, and were quiet some more, then slowly went back to their sandwiches and coca cola and children in wet bathing suits. Or which way the river's flowing! Any signs that they are slowing . . . .
a) there have been so very many important things about the war that deserve attention, I felt overwhelmed. And now you know why I don't have a staff job on a daily newspaper. b) Events were moving so fast, that I didn't have time to compose my thoughts. I have had so many conflicting feelings and thoughts about this war in just a few days, and have changed my mind so many times about so many issues, that it was like having an emotional and intellectual hurricane in my head. I didn't want to write a post until the storm settled and I knew what I want to say. I can only urge you to keep reading Allison's blog, and follow her links. Also, here is a link to a full report on my trip to Safed last week . . . .
Full disclosure: As I've mentioned before (I think), I have a new client, this new web-content management company, and one of their clients is Chabad-Lubavitch. It was for their site that I went to Safed last week, to research the humanitarian activities of Chabad there, and the lives of the Lubavitch-chassidic families who have stayed in town for one reason or another, despite the rocket attacks. My story has finally been published, and you can read the whole thing, and see some photos taken by moi, here. Said by Beth to me today: Sarah, you set yourself up for failure. Packaging food for soldiers can help things. Maybe blogging can change the mind of some college student somewhere who doesn't know anything about Israel. But taking on Human Rights Watch? Why do you bother? Before my trip to Safed: rockets. My trip to Safed: no rockets. The day after my trip to Safed: rockets. This is not so good in terms of writing a colorful story, but it is very good in terms of my mental health and gratitude to God. I'm thinking about that family I visited in their bomb shelter. Those four walls are all they see, day in and day out. I wonder whether that teenage girl has finished the embroidery project she got from one of my readers. Just got back from Safed, and I'm fine. Today was a quiet day, rocket-wise. The town was practically deserted, but those who remained behind emerged from their shelters and enjoyed the fresh air and opportunity to run errands. As my bus wound its way through town, I noticed that most food stores were open today, though nothing else was. Of course, everyone was hoping that things stay like this. To give you an idea of how deserted is the town: A neighborhood I visited that usually has 1,000 children in its kindergartens alone, now has a total of about 20 children ages toddler-10 in the day camp they've made in a renovated shelter. They said there was another day camp nearby as well with similar numbers. That should give you a picture. A grocery there had remained open every day throughout the war, the only source of food in town. But nearby was a fruit-and-vegetables store, on the ground floor of an apartment complex, locked up and reeking -- because two weeks ago the owner closed shop in a panic, left town, and has not been back yet to deal with the mess. The family reacted so fast, I've never seen anything like it. Their bomb shelter is down one flight, across the street, and over one block from their house. This explains why they'd been in the shelter all the time; no one can go that distance in 7-10 seconds. So after the police warning, they decided to go home, put together some food, clothes, and things to do, and then go into the shelter. The shelter was so depressing. Just a big white room with harsh lights and three mattresses in the corner for the several families who share this neighborhood shelter. But the city recently installed an air conditioner, so they were excited. Anyway, I left after that to go around town some more with the guy who was distributing food. Given that, as far as I know, the siren never went off today in Safed, I hope they eventually emerged from the shelter. I saw where two rockets had hit houses, one across the street from another. A resident told me that in her neighborhood alone, they've been hit about 8-10 times. A few rockets hit and destroyed homes, a couple hit the courtyard of the complex, and two went into the valley just below her window. But here's a miracle if ever I heard one: several residents told me that one rocket suddenly and oddly changed course just as it approached a building, broke a hole into the new room a family was building onto their apartment -- exactly where they were planning to put a window-- and landed in their home without exploding, just one room away from where several of them were sitting down for a Shabbat meal. Crazy stuff. How do you even begin to say bircat hagomel -- the prayer thanking God for sparing one's life -- for something like that? Just crazy. Anyway, I'm really tired and have to go to sleep. Just letting you all know that I'm safe! But still, do not tell my mom where I went, OK?